I'm sure plenty of people have seen this video of how many remaining years we have to live after subtracting eating, sleeping, time spent in the toilet and so on. In fact, don't watch the video because you'll waste 3 minutes of your life. Life is really very short. And I get a feeling that it will be so much more interesting and fulfilling if there weren't social media and smartphones (then this blog shouldn't exist too). It seems like we are beginning to offload and outsource most of the things we were supposed to do onto technology itself. Whether it is making friends or communicating with people. That's a huge burden technology has to bear. And make no mistake, it will bear it well. Technology will only improve; it will keep taking on more things that we increasingly find cumbersome to do. 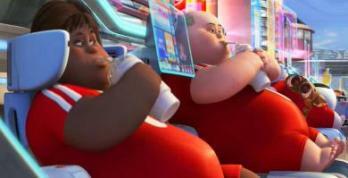 Wall E was, in retrospect, a stroke of prophetic genius. I really wish there's a way to go back to what it once was: Examining the world in curiosity albeit suffering awkwardness; Having lesser but deeper connections; Keeping private what is meant to be kept private.. I see and know too many things I rather not know. Social media is a megaphone for one's opinions; preferences; pet peeves; meal choices; achievements; colour of poop and so on. Again, I believe not every opinion is worth hearing. Stop wasting our lives looking inwards and start looking out to the world. The trees and the leaves seem to lose their lustre to this digital world. Or rather, we'd very much like to spend our precious moments instagraming a well edited scenery than absorb it in entirely. This digital man-made world is meant to glorify man and man alone. Be reminded again how many years we have left - this is the amount of time we have left to make any impact - and most people spent their times watching/posting videos that are far from edifying than they are time-wasting. They are nothing more.. than temporary chuckles. Why should we live for these?